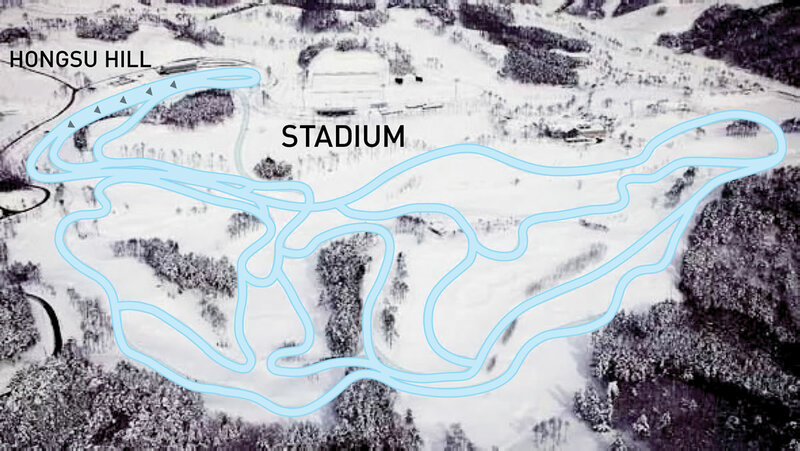 The 2018 PyeongChang Olympics venue, test run at World Cup events last February, offers technical trails, fast corners and one spectacular climb. SOUTH KOREA is an unusual destination for the ski racing circuit. In 2009, PyeongChang hosted the biathlon World Championships, but the World Cup cross country tour had never visited the Korean Peninsula until last February’s test event leading up to the Olympic Winter Games. The cross country events at the 2018 Olympics in PyeongChang will be held at the Alpensia Cross Country Skiing Centre. 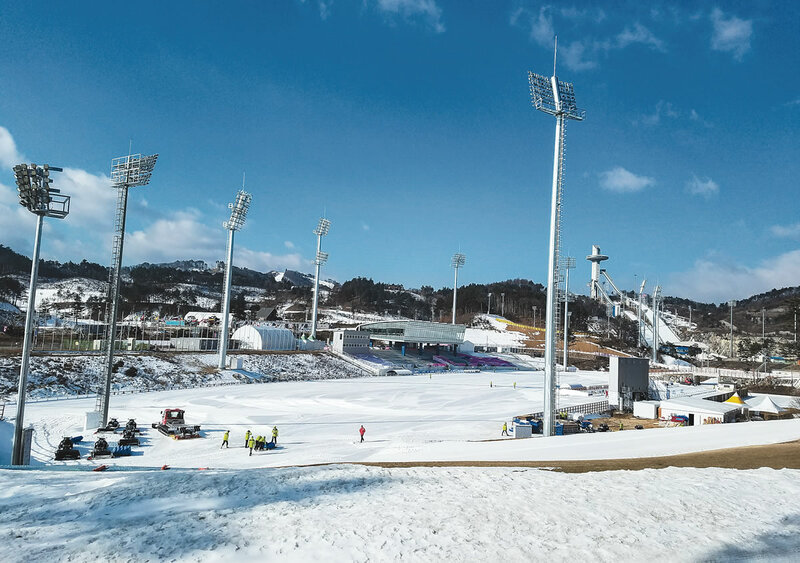 The cross country venue is grouped near ski jumping, biathlon and sliding sports (bobsled, skeleton and luge) within what is being referred to as the Alpensia Olympic Park at the PyeongChang Mountain Cluster. Everything within the Mountain Cluster is located slightly inland from the eastern shore, among the rolling, forested hills of northeastern South Korea’s Taebaek Mountains. During the February test event, I joined the U.S. contingent of athletes and coaches for three World Cup races. After flying to Seoul, we traveled two and a half hours east by bus to a hotel near the future Olympic venue, situated just higher in the hills. There, I was pleasantly surprised to find natural snow on the ground—it gave the whole area a wintrier feel than many European World Cup-host cities. Man-made snow spread in a few spots helped ensure full coverage, and the weather during the six-day trip felt generally mild. Temperatures hovered from the high teens to mid-20s Fahrenheit, typical for that time of year; the only exception to the mildness was the gusty wind. The wax techs, it seemed, found the snow conditions somewhat challenging, and on the windy day we struggled a little to kick our classic skis in the drifted-in tracks. By the race days, however, either the snow had stabilized or our wax experts had found the secret for dealing with the conditions, because the race skis were excellent. The total distance of trails at the cross country venue covers 7.5km, pairing together two separate 3.75km loops. Variations and cutoffs make for sprint and 2.5km loops, and the full 7.5km will be used in the longer distance races. The venue, built on a slightly hilly plateau, lacks any extremely long, sustained climbs, such as might be found among trail systems built into a single, large hillside. Instead, the trails roll over smaller rises, carving punchy, aggressive climbs into the slope before meandering along to the next feature. This geographical profile means that technique transitions—V2 to V1 or double poling to striding—are relentless, and the experienced racer will conserve and build momentum throughout; downhills may enable a brief recovery to ski faster up the next climb. The stadium, with start/finish and spectator-seating areas, is tucked up against one of the area’s larger hills. On par with Falun’s Morderbakken, one of the World Cup’s toughest climbs, this steep, long hill crests into a twisting descent back to the stadium. It’s well placed at the end of the courses, and lactate will flood the racer's bodies as they vie for positions for the finish sprint—I call it Hongsu Hill, hongsu meaning “flood” in Korean. While it’s possible to imagine a much longer hill than Hongsu, which takes only 45 seconds to one minute to ascend, it is one of the most intimidating I’ve seen on the World Cup for its ski-ability and exposure to the crowds. The sprint course is extremely challenging. Out of the stadium, racers power across a level plane before gradually kicking into a smooth, stride-able climb. Men turn at the top of the hill, but the women cut to the left before the crest. From these sharp lefts, the course plunges down toward the stadium. But just before reaching stadium level, the route swings sharply into Hongsu Hill before descending quickly through banked corners. While the turns ski well, I was among several racers who crashed during the test event—I pride myself on my downhill skills, but the bright stadium lighting and sharp corduroy ridges caught me off guard during the classic sprint heats. The classic and skate distance loops have a noticeably different feel from each other, with the sprint loop drawing from the more aggressive skate loop. With three considerable V1 climbs, in addition to plenty of fast, sharply turning downhills, the 3.75km skate loop meets expectations for World Cup-level difficulty. The classic distance loop seems mellower, following gradual climbs across a golf course, sweeping through wide corners and including a long, tuck-able downhill that is surprisingly restful. Racing on the trails of Alpensia during the 2017 World Cup was highly enjoyable; they offer a smooth flow and have well-designed corners. While the courses overall are not as hilly or steep as many on the World Cup, Hongsu Hill is sure to be a focal point with its prominent position above the stadium and its leg-burning length and steepness. And on the trails of PyeongChang there will undoubtedly be plenty of terrain for heroic breakaways, devastating implosions and strategic patience during the 2018 Olympics.